“This Is Jerusalem Calling”: State Radio in Mandate Palestine, by Andrea L. Stanton. Austin, TX: University of Texas Press, 2013. ix + 200 pages. Notes to p. 233. Bibliography to p. 246. Index to p. 258. $55.00 cloth, $25.00 paper. 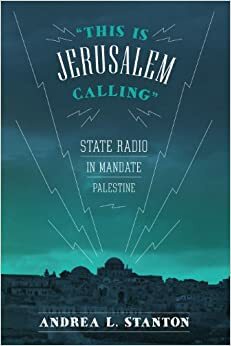 Andrea Stanton’s “This is Jerusalem Calling” examines the history of the Palestine Broadcasting Service (PBS) from 1936 to the Mandate’s end in 1948, analyzing radio both as a new instrument of empire and as a status symbol signifying modernity and urbanity in Arabic newspaper advertisements. Stanton argues effectively that by separating their programming and their languages, the government further exacerbated nationalist tensions between Palestinians and Jews. Also, Stanton contends that Palestinians employed the PBS to disseminate a Palestinian and pan-Arab nationalist identity, and that the PBS increasingly became a contested site between Zionists and Palestinian nationalists. Among her main influences are Americanist Susan Douglas’s work on the role of radio in creating nations and other communities and Zimbabwe specialist Timothy Burke’s concept of commodity fetish. Stanton is assistant professor in the University of Denver’s department of religious studies. Her research primarily focuses on Islam in the Middle East and around the world during the twentieth and twenty-first centuries. “This is Jerusalem Calling” is her first book-length publication. In her analysis of the ways in which the British utilized radio as a tool of imperialism, Stanton shows how the Mandate government used it to intensify urban-rural divisions among Palestinians. Her deconstruction of rural programming demonstrates how the British authorities perceived rural Palestinians as homogenous and ignorant, as well as preferring “unsophisticated” programming and being particularly susceptible to Italian broadcasting. Consequently, the British targeted rural Palestinians with largely farming-related educational programming “focused on literacy and small scale improvements to existing farming practices.” It aimed to keep them in the countryside, which reinforced the overall rural education policy, rather than providing “broad training in machine and other advanced technology” (p. 85). Stanton also explores the PBS’s religious broadcasts, which illustrate how the Mandate’s policies increased divisions between religious communities in Palestine. Following the assumption that religious identities were both discrete and of utmost importance to the people of Palestine, the government soon found itself broadcasting weekly readings, and eventually services, for a number of religious groups. However, the government was keen to avoid on-air political statements, so another way in which it “managed religion” was by requiring sermons to be submitted for censorship before airing. Stanton’s treatment of this subject left many questions unanswered; for example, were religious leaders ever able to impart nationalist messages in their sermons, despite the censor? Examples and analysis of sermons and weekly readings would have been instructive to include here. Highlights of the book include its biographies of businessman T.S. Boutagy and ‘Ajaj Nuwayhid, the PBS’s controller of Arabic programming from 1941–43. Stanton describes how T.S. Boutagy & Sons were “the most prominent purveyors of radio sets in Arab Palestine” during the Mandate period, in part due to its possession of sole distribution and sales rights to a particular brand of radio, but also because of the family’s creative, intimate advertising copy, which was particularly ubiquitous in the pages of the Filastin newspaper (p. 48). Stanton describes how urban Palestinian businesspeople like Boutagy portrayed both rural and urban customers as being savvy and sophisticated, in contrast to the British authorities described above. As for PBS Arabic controller ‘Ajaj Nuwayhid, Stanton argues that he endeavored to promote a Palestinian and Arab nationalist identity by means of excellent programming. Nuwayhid, a Druze, believed Islam was an important basis of cultural affinity for Arabs, so he increased the airtime for Islamic programming. Also, he devoted a considerable amount of programming to women broadcasters on topics of interest to “modern,” urban elite women, such as household management, with the intent of demonstrating Palestine’s modernity, national identity, and readiness for self-rule. Stanton contextualizes these talks by connecting them to discussions of women’s issues in the Arabic press. The biographies of Nuwayhid’s predecessor, Ibrahim Tuqan, and his successor, ‘Azmi Nashashibi, would have been welcome additions to the book. Despite her important contributions, a few of Stanton’s conclusions overreach her evidence. Her argument that radio enabled an urban Palestinian “nationalist modernity” to develop via the PBS is problematic, given the dearth of statistics on how many people actually tuned in. Only some 10 percent of the entire population had radio set licenses (p. 11–12), and of that fraction, “Jews made up four-fifths of the PBS audience” (p. 186). Even assuming multiple listeners per receiver, this is quite a small part of the Palestinian population. Additionally, the PBS was competing for the attention of the Palestinian audience with Radio Cairo, Damascus, and several other stations. Also, Stanton’s argument that the PBS was a contested site of nationalism is not convincing. The examples she cites indicate far more tensions between Jewish listeners and the British authorities than with Palestinians. Finally, the Dome of the Rock is not a mosque (p. 198) and the timeline contains a few errors. For example, the emergence of the Irgun is dated 1931 instead of 1937, and its full name is merely translated rather than explained. “Zionist national military” suggests that the Irgun was the main Zionist paramilitary, when in fact it was a terrorist group that split from the Haganah. Overall, Stanton’s analysis of radio as a new tool of the colonial state contributes a great deal to studies of Mandate Palestine and imperialism. Her book is the first on radio as a mechanism of both imperialism and nation-building during the Mandate period. In addition to Mandate, media studies, and imperialism specialists, general readers will also find much to interest them in this book. Elizabeth Brownson is assistant professor of history at the University of Wisconsin, Parkside, and author of a recent article for this journal. She is preparing her thesis, “Gender, Muslim Family Law, and Contesting Patriarchy in Mandate Palestine,” for publication.